Patellar Tendinitis | Podiatry Associates, P.C. A pogo stick can be tons of fun, jumping up and down over and over again. Unfortunately, our bodies aren’t built the same way. If we jump repetitively, it can actually result in patellar tendinitis, and there’s nothing fun about knee pain! Also known as jumper’s knee—for obvious reasons—this condition affects the tendon that connects your kneecap (patellar) to your shin bone. Repeated stress causes inflammation and pain, but Castle Pines Physical Therapy can help you put the jump back into your step. Continuous jumping and landing can cause tiny tears in the patellar tendon. Over time the tears can become so numerous that the tendon is weakened and becomes inflamed. This can happen to anyone, especially kids who love to jump and play. You are most at risk if you participate in sports like basketball, volleyball, soccer, gymnastics, running, and high-jumping in track and field. Other contributing factors include sudden increases in impact or intensity of activities, strain due to tight thigh or hamstring muscles, and muscular imbalances. 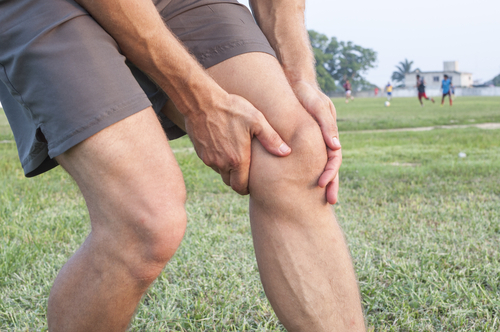 Pain below your kneecap is the first sign of patellar tendinitis. It may start out hurting only during activity, but can eventually interfere with your sports performance, as well as simple daily tasks like getting up from a chair, kneeling, squatting, or climbing stairs. You may also experience redness and swelling in the area, leg or calf weakness, balance problems, and difficulty straightening your leg. It may seem like a minor injury at first, but left untreated it can progress to be much worse, and even require surgery. Prompt treatment of the problem is essential to a speedy recovery. At the first warning signs, seek help. An ultrasound, x-ray, or MRI may help confirm the diagnosis and determine the extent of the injury so that proper treatment can begin. Typically this involves anti-inflammatory medications and physical therapy. Stretching and strengthening exercises will help lengthen the tendon and build surrounding muscle strength. Wearing a patellar tendon strap around the knee can help redistribute pressure and strain to alleviate pain. A hefty helping of RICE (rest, ice, compression, and elevation) is also recommended. If pain becomes chronic, other treatment methods may need to be explored, including corticosteroid injections or surgery to remove damaged portions of the tendon. Recovery can take anywhere from a few weeks to several months depending on the severity of the condition. You should stay away from any activity that can aggravate the problem. When you start feeling better, it’s a good idea to try lower impact sports for a while, like swimming, for instance. To prevent the possibility of patellar tendinitis, stretch and warm up your muscles before jumping right into a workout, practice, or game. Work on muscle strength and perfecting your technique, too. If you feel pain, be sure to listen to your body, stop the activity, and make a call to Castle Pines Physical Therapy. Dial (303) 805-5156 to make an appointment with Dr. Jennifer Molner, or visit us in Castle Pines, CO. With our help, things will be looking up in no time!